Does the fossil record destroy the evolutionary model? Nathan Jones: Tell us about the fossil record. Doesn't the fossil record prove Evolution? Mike Riddle: When you look in school textbooks they'll say the fossil record sure proves Evolution. Here's another critical thinking question that I just love and I train our youth to ask this question. When you look in the textbooks we see all these transitional fossils there. But, here's the question — how much of that fossil was actually found, and how much was added in by an artist based on assumptions? What we find in reality are very few fragments of a lot of these fossils. The rest is just drawn by an artist. Dr. Reagan: What amazes me is they will find just one tooth — one tooth — and then an artist will draw this entire Neanderthal ape-looking person, all from one tooth. Mike Riddle: That's right, that's been done before. It's all imagination. Nathan Jones: When I was in seventh grade, we had a guy come to our class and put all these skulls on the table. He declared, "Look, this is the progression of humankind." So, I asked him, "Are those real, genuine skulls?" He actually answered, "Yes, yes, they are. These are real fossils." But in truth, not a single one of them could have actually been a real fossil of a pre-human skull. They were merely artist's plaster castings. And yet, this Evolutionist went up in front of our class and told us that the fossil record proved Evolution. He lied to a room full of kids. In truth, there is nothing in the fossil record that supports Evolution, for there are no transitional fossils of creatures changing from one species to another. Mike Riddle: When we look at the fossils, what do we find? For example, what does the fossil turtle look like? Exactly like a turtle. There is a bat that is supposed to be millions and millions years old, this fossilized bat, well it looks exactly like a bat. Dr. Reagan: What about a dog? Mike Riddle: A dog? They look like dogs. Dr. Reagan: Have you ever found a dat? Mike Riddle: We haven't found any of those either. Evolutionists say alligators go back hundreds of millions of years. Guess what? They look like in their fossil record the same as today — alligators. Every creature that is living today, if we can find their fossil, looks almost exactly like it is today. Let's then talk about fossil graveyards. These are grave yards where we find hundreds, sometimes thousands, of different kinds of creatures all buried and mangled together. In some cases dinosaurs are buried with all different kinds of creatures. First, how are fossils formed? They have to be buried rapidly by the sediment to keep the oxygen out and the scavengers out, or you're the bones are never going to become fossils. How do you get thousands of creatures in these fossil graveyards such as fish, mammals, and reptiles all buried together? They don't all live in the same zones even. We find most of these fossil graveyards in sediments laid down by water. So, fossil graveyards are not created by long, slow processes. It takes a catastrophic event to mix all these animals together. And yet, we find these fossil graveyards all over the world. What does that tell you? It is a great indicator of a worldwide flood. Dr. Reagan: I read one time where the writer said that the fossil record isn't really a record of historical ages, instead it is a record of an event, and that event is a worldwide flood. Mike Riddle: Exactly, fossil graveyards just scream of a worldwide flood. 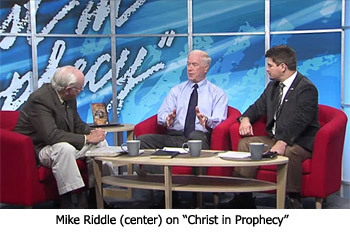 In the ninth segment of this Creation training series with Mike Riddle, he'll explain why the earliest datings of human records destroys the Evolutionary model.